The Yuru Kabgyat Festival is usually held during July-August. The Yuru Kabgyat is a two day long festival which is held with tremendous zeal and enthusiasm at Lamayuru. This festival is attended by numerous people from abroad. The Buddhists come from various countries like China, Japan, Tibet and Korea and attend the festival of Yuru Kabgyat in Ladakh. The festival is celebrated with tremendous zeal. Colorfully dressed Buddhist Monks participate in the dance drama. 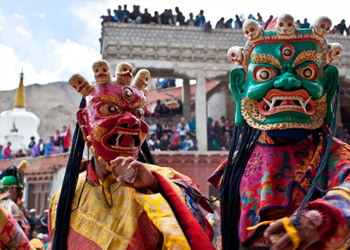 The dance consists of Chhams in which the lamas form the circles with large colorful masks. This circular movement is often accompanied by drum beats, long pipes and cymbals. The masks are usually made from paper mache and there is also a thin coat of plaster enveloping it. This dance drama concludes with sacrificial offerings.